October, aka my favorite month, is here - check. Cooler weather is here - check. Market full of pumpkins and squash - check. Bring on the comfort food! Creamy, extra cheesy homemade mac and cheese clearly qualifies as comfort food. 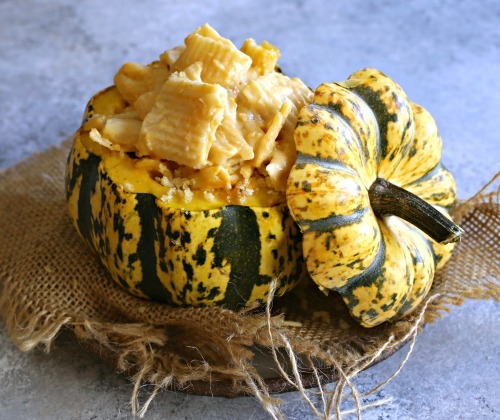 And even if you're a purist who doesn't like extra vegetables snuck into the mac, I would argue that squash is an exception. It adds a creamy sweetness that's just another layer of comfort. 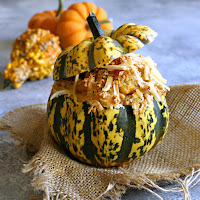 If you didn't want to go to the trouble of serving this in a squash bowl, you could just chop up any squash you like, roast it and stir it into the cheesy sauce. But I can't resist using these gorgeous autumn beauties all over my house as decoration and as part of the meal. 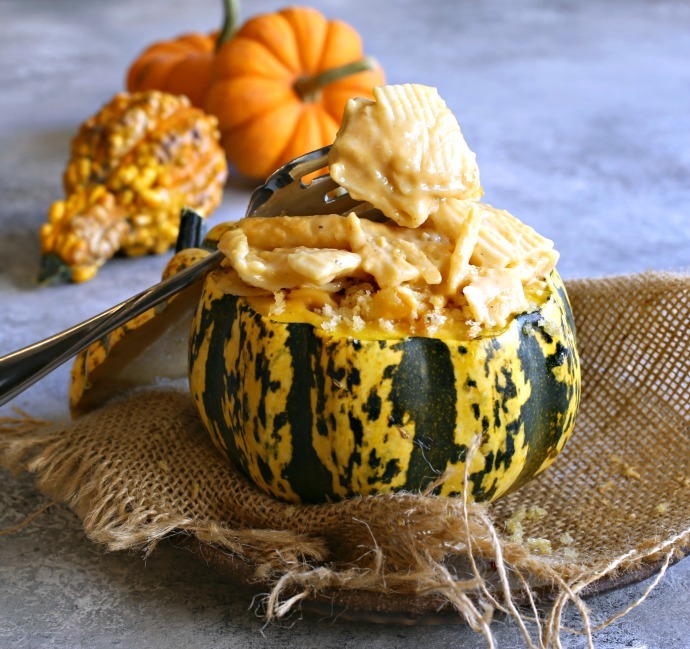 Plus, mac and cheese might not seem like company food if you're entertaining but it quickly turns into fancy fare if it's presented in the actual squash. Feel free to use cheddar or any other cheese you like. I just happen to be extra fond of smoked Gouda. But don't skip the nutmeg because it adds that certain something, that unknown flavor that makes the difference between boxed mac and gourmet restaurant mac. Enjoy! 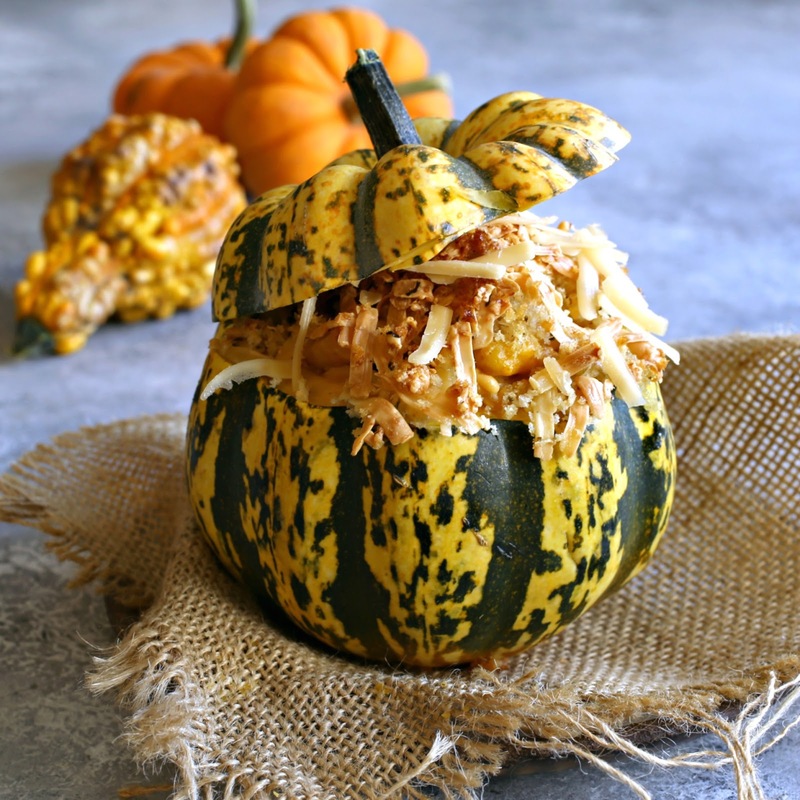 Scoop out the seeds, place the squash bowls (not the lids) on a baking sheet lined with parchment paper and roast for 20 minutes or until the flesh is tender. Allow to cool enough to handle but leave the oven on. While the squash is cooling, melt the butter in a large skillet and, on medium heat, add the garlic. Saute for only a few seconds, until the garlic is fragrant, and then whisk in the flour until a paste forms. Lower the heat and slowly whisk in the milk until the mixture is smooth. Stir in the grated cheese, pepper, nutmeg and salt. Cook the pasta in boiling salted water according to package directions. While it cooks, continue cooking the cheese mixture, stirring occasionally, until it thickens. Scoop most of the flesh out of the cooked and cooled squash and stir it into the cheese mixture. Drain the cooked pasta and combine it with the cheese sauce. 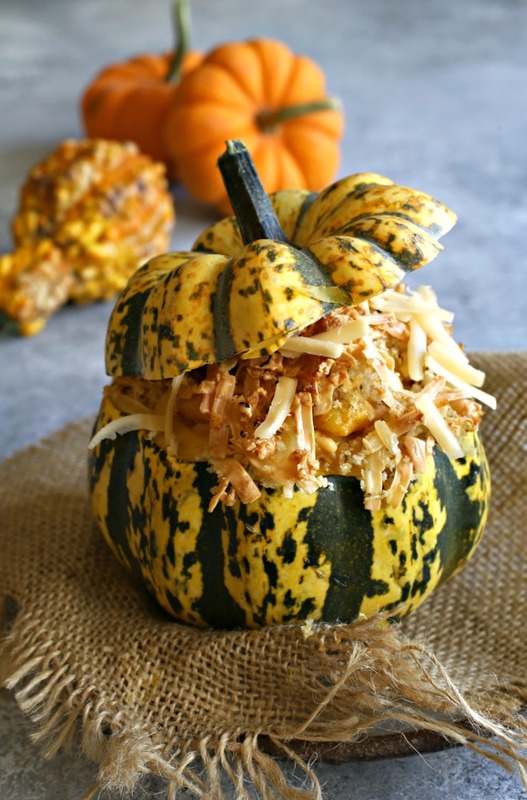 Scoop equal amounts of the pasta mixture into the hollowed out squash bowls. Combine the breadcrumbs and oil and sprinkle over the tops of the pasta. Return to the oven for an additional 15 minutes or until the breadcrumbs are a light golden brown.